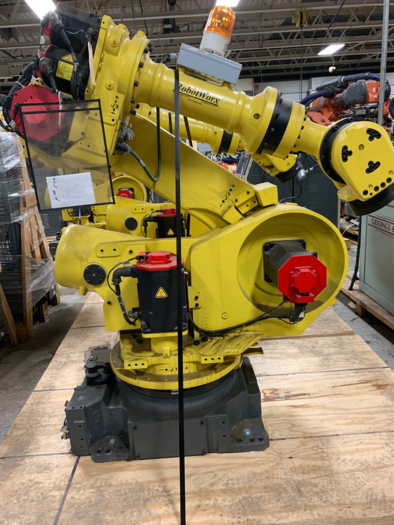 The FANUC R-2000iA/200FO is the "Forward Option" robot consisting of a 200kg payload. Part of the R-2000iA series, it is the latest generation six-axis, heavy-payload high-performance robot. It brings higher value to your production line with its improved performance, reliability, and maintainability. The R2000iA/200FO enables operation in confined spaces with it's slim arm and wrist that also helps to minimize any interference during use. Even with a slim wrist, this robot can accomplish a variety of heavy handling challenges with large allowable wrist moments and inertias. It also has a stationary outer arm to simplify hose and cable dress-out, helping to extend service life. Ultimately, this robot will not only bring you higher productivity and lower maintenance intervals, but more importantly lower operating costs. The FANUC R-2000iA/200FO also has a variety of process attachment points to help make integration easier. The R-2000iA/200FO is paired with the RJ3iB controller.